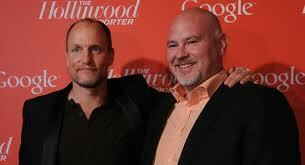 WataugaWatch: Schmidt: "Voter Fraud Really Doesn't Exist"
Steve Schmidt with actor Woody Harrelson, who played him in "Game Change"
I think that one of the things you always want to be for whether you’re a Democrat or Republican, you want everyone who is eligible to vote to vote. That’s how you want to win elections. I think that all of this stuff that has transpired over the last two years is in search of a solution to a problem, voting fraud, that doesn’t really exist when you look deeply at the question. It’s part of the mythology now in the Republican Party that there’s widespread voter fraud across the country. In fact, there’s not. Both sides are lawyered up to the nth degree and they’ll all posture back and forth on it but it probably won’t come down to lawyers. We know, Steve, but you're being disingenuous if you think that your side wants "everyone who is eligible to vote to vote." The myth of voter fraud serves a larger, darker purpose, and surely you know that. Well, of course you do.